I am a New Yorker! I live and work in Manhattan. I enjoy going out to eat and drink. With over ten thousand places in NYC, it's easy to find new restaurants and variety of cuisines to experience. Here you will find my notes, reviews, updates and opinions on restaurants, food, drinks, etc. When I travel you will also find updates on hotels, restaurants and bars from other cities and countries. I am truly grateful and thankfull to have what I have and do what I am able to. Enjoy! 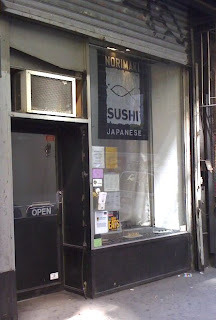 It's very easy to miss and walk by this sushi haven in the middle of these grey buildings in the Fashion / Garment District. Once inside you will witness the minimalist decor with an industrialist ambiance but the sushi is the main reason you are here for so stop looking around and enjoy your food. 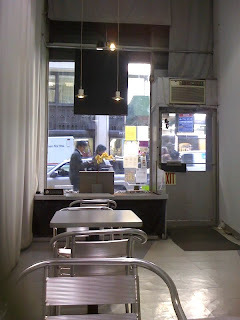 The menu is somewhat limited in comparison to a usual Japanese restaurant but they have all the popular items such as Rolls (maki), Hand rolls (temaki), Sushi a la cart (Nigirizushi), Udon ( in the fall and winter) and a soup or salad option. 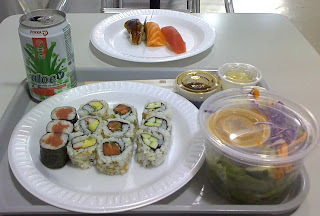 They offer a great deal on Preset Lunch Specials (basically twelve individual pieces of rolls and a choice of miso soup or small salad) for $7.25 to $7.95. Chef behind the counter prepares the sushi per your order. During the lunch time, they have some rolls already in the fridge but most of the time you will have to wait for your order few minutes longer. You can take your order to go but it's much better to order your food, pay, pick up your number and take a seat. In few minutes they will bring your food to your table in the mean time you can catch up on your iPod listening or reading that paperback. It is really a nice treat to order and enjoy a truly satisfying meal and sit down to take few minutes off the craziness out there. There is a variety of soft drinks and bottled Japanese tea beverages. Pros: Fresh, made-to-order sushi. Great lunch packages. I am a New Yorker! I live and work in Manhattan. I enjoy going out to eat and drink. With over ten thousand places in NYC, it's easy to find new restaurants and variety of cuisines to experience. Here you will find my notes, reviews, updates and opinions on restaurants, food, drinks, etc. When I travel you will also see updates on hotels, restaurants and bars from other cities and countries. I am truly grateful and thankful to be able to experience life to the fullest in the greatest city in the world. Recent reviews by Sebastian S.
Kwame Onwuachi on Special Sauce: Notes From a Young Black Chef - The Kith/Kin chef talks about the high of cooking for others and how Obama's election affected his life's trajectory. 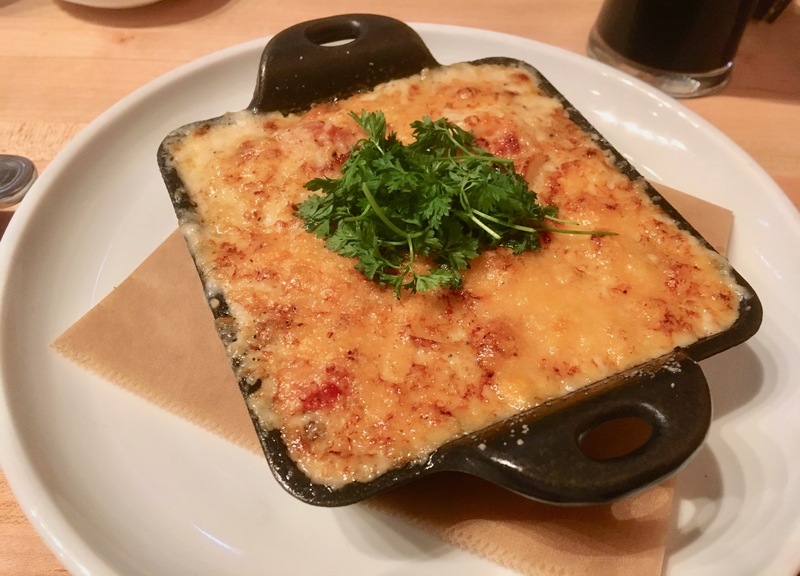 Where to Get Great Mac and Cheese From Coast to Coast - If you’re hankering for a gooey, creamy bowl of mac and cheese, here’s where to find some of the best. Read my Food Network story here. The Wine Whore - A Blog that Works for Wine!